Twice Baked Potatoes. They look difficult, but they really aren’t that hard. There’s a trick to it, though. Hi. It’s Lois at Recipe Idea Shop, talking about Twice Baked Potatoes. 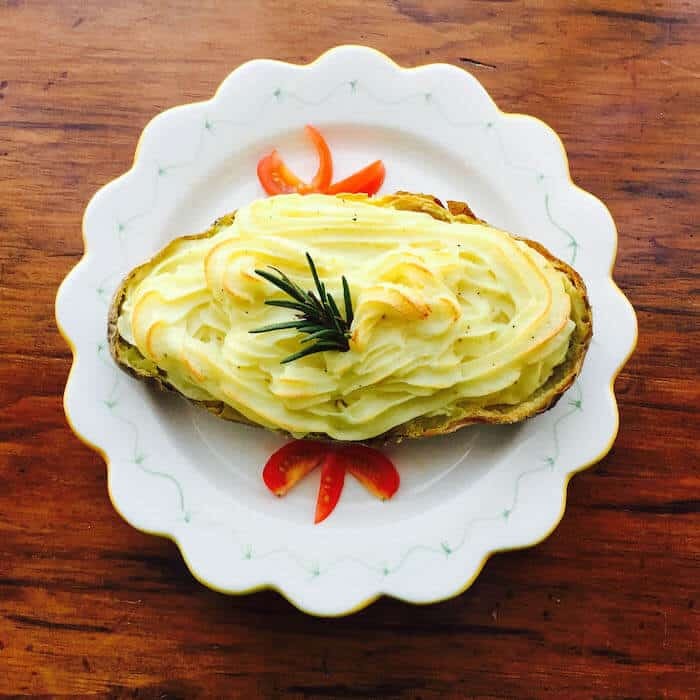 I have always thought Twice Baked Potatoes are a truly decadent way to eat potatoes. However, until recently, I had never made them. They seemed somewhat intimidating. But I found out they aren’t that hard…after I messed it up the first time. Don and I had some friends over for supper last weekend and I decided to give Twice Baked Potatoes a try. I messed them up the first time, waiting too long until I whipped them and also adding too much cream. So they were lumpy and very starchy tasting. Some potatoes have more starch than others. I used good, russet baking potatoes for my recipe and this type of potato contains more starch than some others. I had under-baked the potatoes a bit, and then I waited about 45 minutes before I cut them and removed the insides to make the mashed potatoes. Even though I warmed them up before whipping them, I could not get rid of the lumps. And the longer I whipped them, the more sticky and starchy they got. They were okay, but not delicious. The second time around, I made sure to completely bake them until they were soft and I began the whipping process within about 10 minutes of taking them out of the oven. This worked so much better! Potato ricer. Buy it on Amazon. The Twice Baked Potatoes that I served to my guests were perfect. I simply made Mashed Potatoes from the Baked Potatoes, then put the whipped potatoes back in the skins. I used my Super Shooter cookie press to make them pretty, using the decorator tip, but I think it would be much easier to use a pastry bag. A pastry bag would be easier to fill. When serving the Twice Baked Potatoes, I offered a variety of toppings, including sour cream, butter, chopped chives, and crisp bacon. Our guests enjoyed them. Don’t you think you’d love them, too? 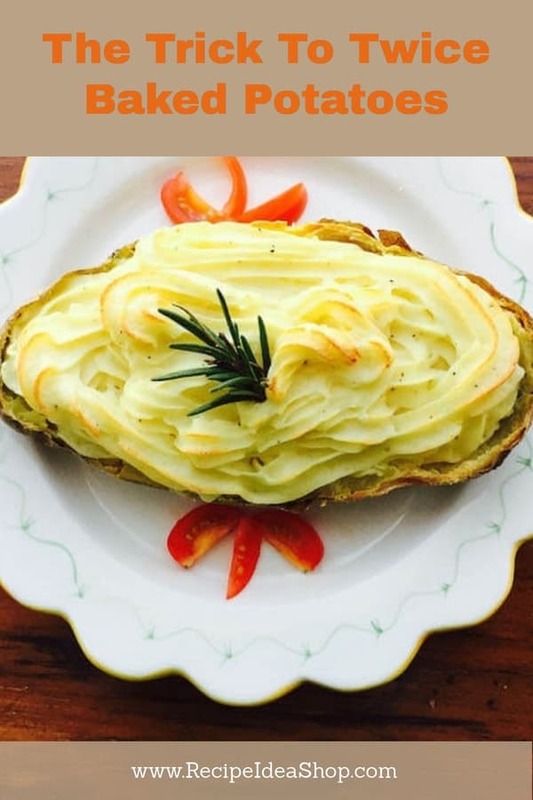 Have you made Twice Baked Potatoes? How about making some today? Poke each potato a couple times to let the steam escape. Put the potatoes in the oven and bake for about 1-1/4 hours. Remove potatoes from the oven when the insides are squishy and the skins are crispy. Let sit 5-10 minutes before cutting in half. Cut in half lengthwise and carefully scoop the meat of the potato out of the skins. Set the skins aside to refill later. Rice the potato meat into a medium bowl. Add the butter to the potatoes and mix to melt it. Add the milk, a little at a time, as you whip the potatoes with an electric mixer. Spoon most of the whipped potatoes back into the skins, mounding a bit higher than the skins. Using a pastry skin with a decorator tip, squeeze a top layer of potatoes onto the filled skins, making nice ridges. Return the potatoes to the oven and bake for about 20 minutes until the tops/ridges of the mashed potatoes begin to crisp and brown. Twice Baked Potatoes Nutrition Label. Each serving is 1/2 a medium baking potato, stuffed with mashed potatoes.